Sound Transit trains are suddenly filling 40 percent of the time at rush hour, causing some rider grumbling and a closer look at adding capacity. 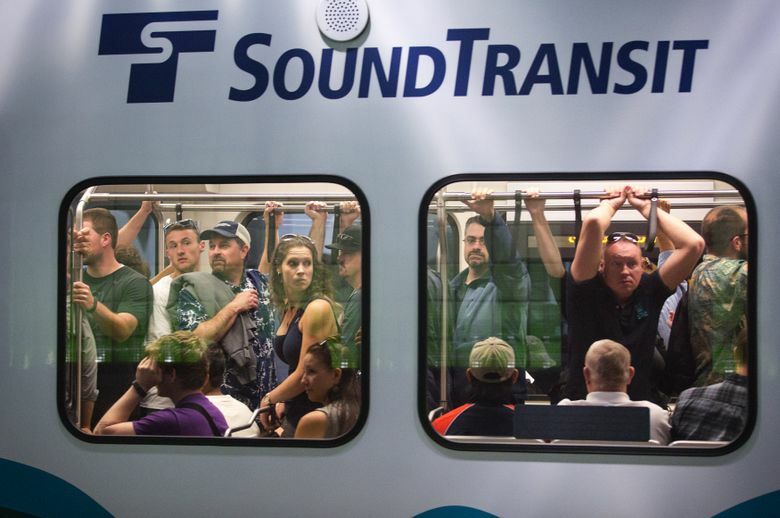 After six years of running trains too empty, Sound Transit is suddenly wrestling with a quite different dilemma — light rail is becoming crowded enough that passengers are clamoring for more railcars. About 65,000 riders a day are taking light rail, two-thirds more than a year ago, because of the University of Washington and Capitol Hill stations that opened in March. The numbers aren’t a huge surprise in a densely populated corridor, but ridership has already reached the levels expected in 2018. Transit managers have deployed a few more railcars but don’t have enough to convert the entire fleet of two-car trains into three-car trains. Crowding isn’t severe enough to justify major costs to run a three-car fleet, they say. Fuller trains are crossing the city as voters consider this fall’s $54 billion Sound Transit 3 ballot measure, to increase annual taxes for a median household by about $326. That would add 62 miles of light-rail lines in seven directions by 2041, bus-rapid transit lines and more Sounder train capacity. Sound Transit CEO Peter Rogoff proposes a second downtown transit tunnel to prevent crippling bottlenecks. “They are rare incidents, but they are very real incidents, when we’ve got real crush loads,” Rogoff said. “People let a train go by, to board the next train.” He’s bracing for the first 80,000-rider day. For now, passengers are adapting by gathering closer together than Pacific Northwesterners like. Or they commiserate that Sound Transit should provide long trains. “They need to always run with three cars, anticipating the people are going to get on and use them. They have that capability,” said Kristina Sawyckyj, who struggled to steer her electric wheelchair through baseball fans and onto a train last Tuesday night, on her commute from night school to Rainier Valley. Minutes later, a man waiting at Columbia City Station kicked a window, freaked out because he feared the slowly arriving, full train would pass him up. Riders shuffled to let him and a companion aboard. 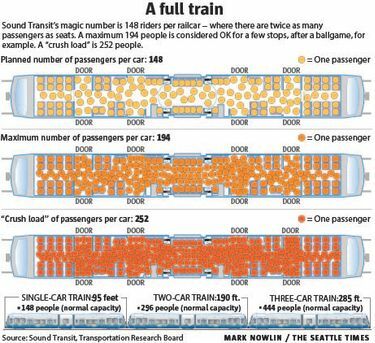 Ideally, each railcar carries the same number of people standing as sitting — 74 of each, for a total of 148. You can find a strap to hold, and there’s no need to bump bodies. Lasers on board 30 percent of trains take sample counts of riders at the doorway. Based on data for the International District/Chinatown Station this spring, some 40 percent of afternoon-peak trains traveling south exceeded the magic number of 148 passengers. A few dozen trains neared the full capacity of 194 riders, where passengers jostle. On April 29, while the Alaskan Way Viaduct was closed for tunnel drilling underneath, a couple of railcars carried what industry standards deem a “crush load” of 252 people. Each person had, on average, less than 2 square feet of room. 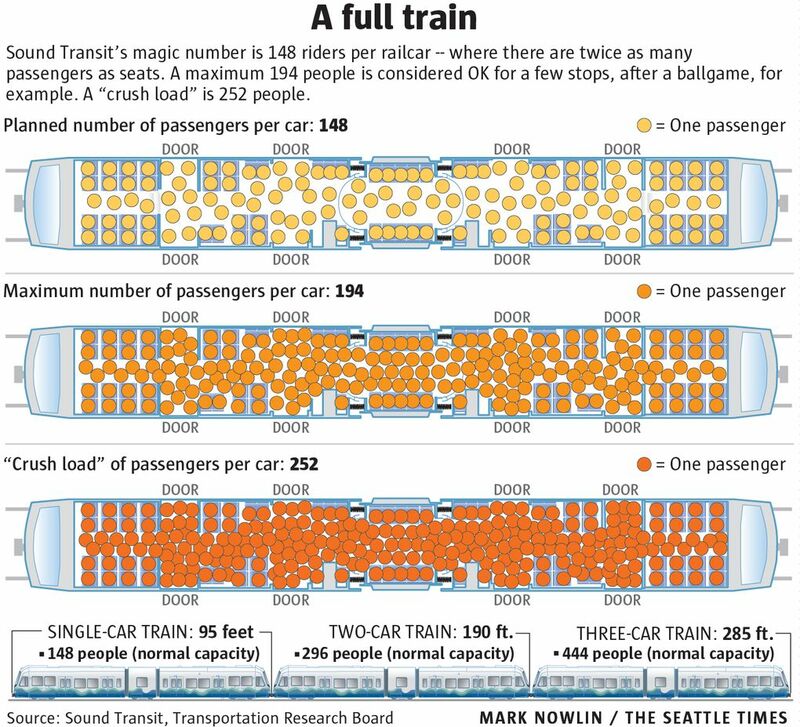 Rogoff told the Sound Transit board Thursday that crowds can arrive unexpectedly, even when there’s no ballgame or concert, and he needs to get better at predicting that. But overall, the system is operating as designed, officials insist. “I’ll take standing for 10 minutes on a crowded train over fighting traffic from a bus or my car for 30 minutes any day,” spokesman Bruce Gray said. Sound Transit’s service plan says that if any scheduled train exceeds the 148 riders on 60 percent of its daily runs, capacity will be added. Full trains are practically certain to provide photo-ops for the Sound Transit 3 campaign. “Light rail is popular. People love it. The fact is, people want to ride it,” said James Canning, spokesman for the Mass Transit Now campaign. A million residents are expected to move to urban Puget Sound by the time ST3 would be built out. “You’ll be voting for more high-capacity transit, and for meeting the need,” he said. Maggie Fimia of the No Sound Transit 3 campaign said ridership figures hide large populations who were diverted from other transit. “They created this problem when they rerouted two dozen bus routes in Northeast Seattle to feed the trains,” she said. Sound Transit didn’t explore cost-effective alternatives to ST3, like delivering rapid buses soon to meet demand, rather than embark on suburban trains and a billion-dollar Seattle tunnel, said opponent Kevin Wallace, a Bellevue City Council member. “They’ve gone to a very expensive solution that takes a long time to build,” he said. In October 2010, ridership was so low that Sound Transit resorted to single-car trains at night, to save $460,000 a year during the recession. The new paradigm of busy trains creates operating costs, but added about $1 million in farebox revenue in the first six weeks after the UW and Capitol Hill stations opened. • Deployed four more railcars, so now six of the 17 peak-time trains are triples. • Collaborated with King County Metro Transit, which operates 40 buses in the busiest hour in the downtown tunnel. When buses stall, people fumble for change, or wheelchair ramps are used, trains are delayed a couple of minutes. The late trains become overcrowded. Metro increased its staff who pre-emptively tap the bus users’ ORCA fare cards at the boarding platforms, so they file into the buses faster, Rogoff said. Two peak bus trips are moving out of the tunnel in September. But the tunnel isn’t scheduled to become train-only until Northgate Station opens in 2021, or until a state convention-center expansion removes the bus access at Convention Place Station, whichever comes first, said Gray. • Decorated trains with cartoon penguins who say “Don’t huddle near the door” or monkeys instructing “Don’t hang around the door.” This campaign follows earlier messages about so-called manspreading, where somebody’s legs or bags hog the adjoining seats. Transit-board member Rob Johnson, a Seattle City Council member, said the marketing is great for showing newcomers how to use the growing system. His children enjoy the monkeys. “I find it offensive, as a person who gets stuck by the door occasionally because there’s nowhere else to go,” Sawyckyj said. Morning crowds make it difficult for her to reach the wheelchair space, where three seats flip up. Some 5,400 more boardings are expected when Angle Lake Station south of the aiport opens in September.The agency plans a slight capacity increase, so that seven of 19 peak trains run with three railcars. Transit-board member Pat McCarthy, the Pierce County executive, said severe crowding lasts only a few minutes and doesn’t rival the frequent nose-to-nose encounters she’s experienced in D.C. The agency will be ordering 122 railcars to allow four-car trains when Northgate, Roosevelt and U District stations open in 2021, and on the 2023 line connecting Overlake, Bellevue and Chinatown, which continues to Northgate. At that point, capacity in central Seattle will be almost four times what it is now. Seattle-area customers could become spoiled.